Pinwheel or roll-up sandwiches are a great option for tailgating because they are easy and you can make them ahead of time. I am all about efficiency when planning our tailgate menus, so anything I can make ahead of time is a winner in my book. 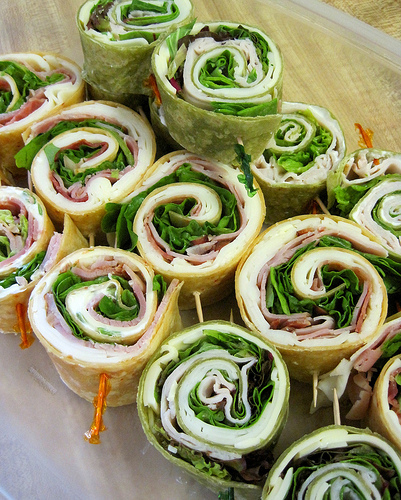 The pinwheel sandwiches can be made with so many variations and they are relatively healthy too. Get creative and let me know your favorite combo. Here is my turkey pinwheel sandwich recipe. Spread cream cheese over entire surface of tortillas (spinach and sun-dried tomato tortillas are also really good). Add lettuce and two slices of turkey. Roll the tortillas up, starting at the edge. Warp in sara wrap and refrigerate. Slice into 1 inch pieces when you are ready to eat them. These look so delicious!!!! They also look really pretty! YOu make them sound so easy which is awesome for me because I am a terrible cook! I am definitely going to snag this from you! Thanks, Mary! I promise they are as easy as I make them sound.